The Autel AutoLink AL319 is an awesome and affordable scan tool for the average user. The speed and simplicity of this OBD2 tool will lessen your headache when that nasty Check Engine Light turns on. Need to know if your vehicle can pass an emissions check? With one click of the Autoling AL319 you will know. Whether you are just enjoy tinkering with your Honda Civic, or you make a living fixing cars, you’ll find a use for this OBD2 scanner. We’ve written this Autel AutoLink AL319 review because we believe this tool will save you countless hours! The automotive industry is constantly changing. This includes the technology that is being used in today’s vehicles. With the introduction of OBD II, there have been many changes to the way vehicles operate. Almost every system on a vehicle is computer controlled. Some systems operate from their own module, or share modules with other systems. In order for the computer to monitor these systems it uses different sensors to obtain the data that is needed. This makes it very difficult to diagnose an issue with a vehicle since a lot of these sensors and systems work together. Without the correct tools, the average person will not have a clue where to start when in reference to diagnosing a problem with their vehicle. A check engine light concern is a perfect example of this. Many think that a code from a check engine light is the only answer needed to correct an issue with their vehicle. This is not always the case since a code simply points in the general direction of what is causing the light to be on. With the proper scan tool the guesswork of where to start can be eliminated. The Autel AutoLink AL319 is a perfect example of an affordable scan tool that can aid in the diagnostic procedure. This scan tool not only gives you access to diagnostic troubles codes, but also has other options that help aid in any check engine light related repair. Read and clear generic and manufacture-specific OBD2 DTC codes! Low cost saves money and helps you get the job done! Accurate info helps you fix your car or truck quickly! Trusted brand, Autel, means you\’re getting a quality scanner that will last a lifetime! The vehicles computer uses monitors to inspect most electronically controlled components. These different monitors will run self-tests to let the computer know if there is an issue, and where it is located. If there is an issue with a system, the computer will set a code which will then turn on the check engine light. Whenever a check engine light, or computer is reset these monitors will stay “not ready” until the required tests are completed. After repairing a vehicle it is important to verify the repair. When correcting a check engine light, knowing if these monitors are complete is very important. In most cases, if the monitor completes, and changes to “ready” then the repair can be verified as completed. The Autel AutoLink AL319 makes knowing if the monitors are completed very easy. The color display, audible tones, and one touch access to the vehicle readiness monitors can surely aid in any check engine light repair procedure. The other benefit to knowing the status of the vehicle readiness monitors is for state inspection. Many states require emissions inspections. Having these systems ready is part of the emission inspection. If these systems are not ready then the vehicle will most likely not pass the inspection requirements. This scan tool is essential when ensuring that the required monitors are set, and ready before inspection. When diagnosing a check engine light concern it is very important to duplicate what caused the check engine light to come on. How fast the vehicle was moving, engine temperature, and fuel trims are only some of the clues that can lead to the diagnosis of a check engine light concern. This information is stored by the computer at the time of fault. With this information the situation that caused the check engine light to illuminate can be duplicated. This will allow the individual diagnosing the concern to better locate the root cause of the fault that is causing a stored code. The Autel AutoLink AL319 allows the user to access this information. With this access and a little bit of knowledge you will be able to narrow into the problem with laser precision! When dealing with a check engine light concern the repair cannot be completed until the trouble code is cleared. There is no point in repairing a check engine light concern if the light will continue to be on after the repair. This will also reset the readiness monitors. This will aid with the verification of repair. When resetting the monitors the computer system is clear of any faults. This will allow the individual to know if the problem was corrected by performing a road test, and ensuring that the monitor specific to the issue is reset. Until this is performed the repair cannot be verified. 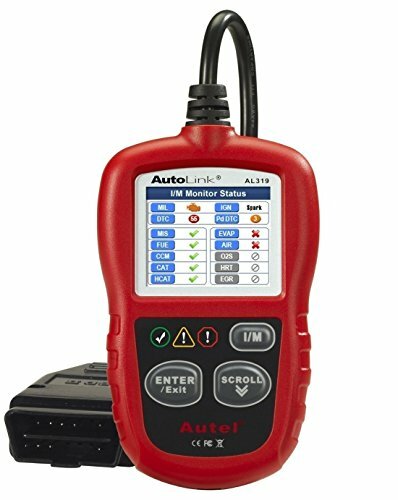 The Autel AutoLink AL319 allows for quick access to both clear diagnostic trouble codes which will reset the monitors, and viewing of the monitors to ensure that they reset with no issues. The colorful display will give you up todate information about the monitors that is easy to read on the monitor status screen. This will surely help with any road test after a repair is performed. The Autel AutoLink AL319 is an affordable scan tool with the some of the same perks as the larger more expensive scan tools. This lightweight scan tool can surely aid with any check engine light repair. We enjoyed the easy-to-read color screen, audible tones, and quick access to readiness monitors delightful. We’ve got a few mechanic buddies who use this scan tool in their shop for the quick access to diagnostic trouble codes, and readiness monitors. The quick access features are easier to use then some larger, more involved scan tools that can be found in repair facilities. The features are limited compared to the larger, more expensive scan tools, but for basic diagnostics the ease of access is a sure winner. The Autel AutoLink AL319 is an awesome and affordable scan tool for the average user. The speed and simplicity of this OBD2 tool will lessen your headache when that nasty Check Engine Light turns on. Need to know if your vehicle can pass an emissions check? With one click of the Autolink AL319 you will know. Whether you are enjoy tinkering with your Honda Civic, make a living fixing cars, or work with emissions, you’ll find value with this OBD2 scanner.